Top Photo: April 15, 2019 The Steelhead guiding has been "outstanding" this spring, hope it continues with the new run of fish. So many beautiful pics to choose from for top photo. Hope you like this one. The gentlemen is a guest with Tracey John Hittel of Kitimat Lodge. It is not too late to book a spring trip. If you need info please contact me anytime. Oh... here is a short list of what we offer; Full service private suites, All inclusive meal plan, Cabins with full kitchen, fridge and stoves, Laundromat, Secluded location, Picnic tables BBQ and Fire pits, Wireless internet, Open year round, Steelhead & Salmon fly fishing, Conventional and spin fishing Saltwater fishing Salmon Halibut and Crab (Dungeness and Alaska King), Jet boat tours Skeena Kalum, Kitimat River Drift Boat fishing full and half days, Coastal Rivers, Nass River and tribs. 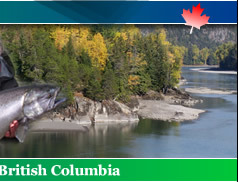 Transport Canada approved vessels, Helicopter fishing, Hot spring Tours. - 2019 Kitimat River drift boat for spring Steelhead coming soon BOOK NOW ! - 2019 Multi Rivers for spring Steelhead coming soon BOOK NOW ! STATS: As of Sunday, March 18, 2018 noelgyger.ca website received an average of 1,698 Visitors per day, 3,330 Page Views per day and 8,298 Unique IPs (over last 2 week period)! Note: To review ALL PAST Tyee Test Fishery data and charts cast here: http://www.noelgyger.ca/news-bulletin.htm Note: NEW section added called Recommended Fly Fishing Gear. Note: FOR SALE Saltwater Lodge ~ info updated August 24, 2018 and the price lowered from $999,000 to $650,000; certainly a real positive for any potential Buyer to have a turn-key business see Market Place section. Update: Tracey Hittel of Kitimat Lodge sent an eight minute Video collage created with some amazing fishing picture, see Kitimat Lodge section for the link. Update: To watch a short YouTube Video "Releasing Salmon in a river" see How to Release Fish webpage: http://www.noelgyger.ca/how-to-release-fish.htm Update: Little bit of history; I did a TV Fishing Show in 1991 with Larry Schoenborn FISHING THE WEST, see the YouTube link in the Kalum River section. Update: Call Jim Teeny 1-800-501-6602 and order his book, see Market Place section. Update: the 2018 Tyee Test Fishery Charts have moved to News Bulletin webpage; all past years can be read here also. Update: as of January 8, 2018 noelgyger.ca fishing video clips on YouTube have received 910,639 views, see Noel Gyger has 96 fishing video clips on YouTube section. 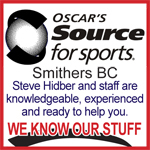 Update: We have a NEW sponsor for this fishing report and it's Teeny Fly Lines. Skeena 1 (non-classified) Exchamsiks River downstream to the ocean. Skeena 2 (class 2 water) Exchamsiks River upstream to 1.5 km above Kalum River. Skeena 3 (non-classified) 1.5 km above the Kalum River upstream to 1.5 km above Zymoetz River. Skeena 4 (class 2 water) 1.5 km above Zymoetz River upstream to the head-waters. A cracking season opener for our clients that visit the Northern BC coast in search of hot Steelhead. One of our clients caught a steelhead in the first pool of the day after 5 casts! Now that’s good guiding. River levels are creeping up and so are the tidal Steelhead entering the rivers for the May spawn. Anglers can make their longest cast with a Scandinavian line with a light tip. BOOK your preferred dates NOW don't miss out! REPORT - Nov 8, 2018 from Tracey John Hittel of Kitimat Lodge, Well the November snow has finally hit the mountains and making its way closer to the majestic Skeena and Kitimat valleys. This fall the Steelhead and Coho fishing was off the charts and pictured above are a few of the snaps we took of our clients from England, USA and Japan. All the Steelhead and Coho were in great shape and hot, making for epic fights on the Sage Spey rods. April will be your next opportunity for Steelhead, so please book your group early as space is already limited for this short season. Thanks again to all our guides and lodge staff and our new and repeat clients. Have a good winter ♥ I suggest you lock in some dates soon by contacting me Tracey John Hittel anytime via e-mail tjhittel@telus.net or give me a call on my cell phone 250-639-4277. REPORT - Nov 5, 2018 from Tracey John Hittel of Kitimat Lodge, SEASON OPENER on April 1, 2019. The above 4 pics were from season opener in 2014 and from all the experience we have we can expect the same in 2019. Steelhead on as many as five rivers, inland and coastal we do em all. We are licensed with rod-days to guide on section 2 of the Skeena and the whole Kalum River. We are already taking bookings and dates are filling in...so...if you and or group are interested I would suggest you lock in some dates soon by contacting me Tracey John Hittel anytime via e-mail tjhittel@telus.net or give me a call on my cell phone 250-639-4277. Oh...and while you are here you should enjoy a feed of fresh Dungeness Crab from the Douglas Channel. PS: We highly recommend the BEST fishing attire by Simms. Hi Noel, This is the video Italo of Canadian Sportfishing shot of my reel when we were in BC last fall. Feel free to share this link: http://berfloatreels.com/river-passion-jordan-feliz/ or Italo Labignan YouTube channel: https://www.youtube.com/user/ItaloLabignan there are more viewing options using Italo's channel :-) The title is "The River - The Passion -YouTube 4K" Enjoy !! Hi Ben, I am honoured to share this beautiful 3 min Steelhead and Coho fishing clip of your fabulous fishing reels. I see Tracey Hittel of Kitimat Lodge doing an excellent job with the net:-) Oh did I say the music is outstanding? Well done my friend! The latest episode of Anchored is live and featuring Roy Henry Vickers Gallery! Roy is a Grammy Award-nominated, Canadian First Nations artist. He is one of Canada’s most revered artists and his work can be found in the Vancouver Airport and galleries around the world. I’ve been a fan of Roy since I was a teenager, so I was excited to have the opportunity to sit down with him at his home on the Skeena River. In this episode of Anchored, Roy and I discuss culture and history, and the story of how he got to where he is today. We take a deeper look at our connection with nature, reflect on a dark part of Canada’s history, and explore the desire to be our best selves. The “page views” statistics give a clear induction of site traffic. “Page view” measures the entire page, and tells you how many times people have visited that particular page. By understanding “page views” and knowing which pages are being looked at, you can determine the overall popularity of a site, and which pages within it are being viewed most often. “Visits” are one of the more useful measurements of web statistics. A visit includes all of the pages viewed by a visitor to your site. The measurement of “Visits” begins when a person enters your site and ends when the same visitor leaves the sir or remains idle for a period of time (usually 30 minutes). Usually, one person visiting your site 15 times is counted the same as 15 people visiting one time each, so you can see, that while useful, the measurement is not perfect. This a more precise way to measure visitors to your site, as each person is counted only once, regardless of how many times they visit during a fixed time frame, typically 30 days. They are measured according to their unique IP address which is a number allocated by an ISP (Interpret Service Provider). Please feel free to contact me Noel Gyger anytime and I will be happy to send you the latest statistics for our website via e-mail PDF attachment. Thank you for your interest. Get your group together and lets go fishing. Contact me anytime and I will send you all the information. Some great shots of our Douglas Channel Saltwater fishing and jet boat trip! This jet boat salmon fishing trip produced excellent catch and lots of fun. Nothing like an impressive halibut catch! The shrimp and crab-feast will be memorable. The Salmon season is now in full swing, Chinook Salmon are running the river and all chrome bright fish. Saltwater fishing is also productive as the Halibut are biting quite nicely as well the Prawns and Crab are filling the pots. A full line-up of guests will be flooding the area for the massive runs of migrating Pacific Salmon, so stay tuned for more awesome pics. this week. The wives pictured with a pair of Skeena Chinook and young Jamieson with a Dungeness Crab. Be sure to check out the outstanding action photo of Jamie Black from Copper Line Excavating releasing a monster Chinook! B.C. Guided Fishing Trips, River Fly Fishing and Ocean Charter Fishing. Kitimat Lodge is quietly nestled among the cliffs of the Kitimat River Valley - strategically located near the Kitimat River and quick access to the Douglas Channel. All suites are fully equipped with wireless Internet and flat screen televisions, including full kitchenette with fridge, stove and coffee maker. Spring Steelhead begins this late March for 6 weeks. If the run of Steelhead was like last year our guests are going to hit pay dirt. Starting in May, thru to August, Chinook Salmon we target either by Jetboats or spacious driftboats, on the rivers, or 30ft Aluminum, twin Volvo Diesel, ocean vessel. 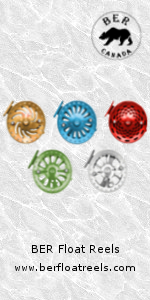 All our boat are fully equipped with top of the line gear. Late July to late September all 5 species of Salmon are in full charge from the ocean to the rivers. We intercept these Salmon either in the Saltwater or small coastal micro streams, using like tackle or fly. The lower 100 miles of the Skeena and its tributaries are a Steelheaders dream, miles of fly water to chase the elusive steelhead. With our access to Classified waters in Skeena country, this allows us flexibility and tranquility for our customers. While you wait to find out what our next FABULOUS offer is, watch to find out what makes Kitimat magical. The fishing is spectacular and the scenery is incredible. We are talking here of both ocean (Douglas Channel) and all of the many, many rivers is northwest BC. Cast on this Facebook link to watch this beautiful 4 minutes video. River in great shape. Good Steelheading now and will continue all winter. Guiding is over for another year but if you need a guide in the spring starting April 1st to show you how and where just contact me anytime. Note: Bait ban Jan 1 - June 15. AND another one, this one a little darker! REPEAT guests are the "best"! Yes, yes repeat guests are the best. After all they know a good thing and would never book again with this lodge if they had a bad trip. Check out some of our testimonials. Best of luck, hope to hear from you soon. Tracey John Hittel owner. It does not get any better than this. "Keep-em-wet" in a soft mesh net to get the perfect pic. It is NOT too late to book a guided fishing trip on this beautiful river. Contact me anytime if you are interested. The Kalum is a tributary of the Skeena and is a river of amazing beauty, only a few of us have the opportunity to guide this river as it’s classified. The steelhead in this river are a mixture of summer, winter and spring steelhead. All by jetboat the Kalum is a Spey fisherman dream, with pools that not only look juicy they fish better. Many big boulders make this river majestic and the Steelhead like to hide in behind them. Not to mention the Chinook Salmon of immense size and quality will frequent during your trip. The season runs from April 1 to May 23.BOOK your trip NOW don't be disappointed. In May of 1991 I did a TV fishing show on the Kalum River with Larry Schoenborn FISHING THE WEST fame! Wow, that was 26 years ago and my beard is not full gray and look at those neoprene waders:-) Our plan was to catch both Chinook and Steelhead on the same day and I must say "we did it" ! This is how it looks when you are trying to drink your coffee and you are blasting up the lower Kalum River at 48 MPH. TITLE of this video: Rocket Boat Steelheading - play time 5:48 minutes. VIDEO INFO: I had the pleasure of fishing with Calvin Higano, Ron Wakita and Glen Kilcup on the Kalum River on Tuesday morning, April 20, 2010 for about four hours. Glen invited us on this trip with his Jet boat crack of dawn. We hooked 4 Steelhead and landed 2 plus a bunch of Trout. We landed one Steelhead using a silver BC Steel spoon with 3 OTT Gamagatsu http://rapala.ca Siwash hook rigged up on a 7' Trophy XL rod http://redlsports.com and an Abu Cardinal 704 http://www.purefishing.com Spinning reel spooled up with 30lb Tuff line Duracast http://www.tuf-line.com This rod and reel Combo handled this Kalum River Steelhead very nicely and was caught and released using Gibbs Catch and Release Net http://www.gibbsfishing.com The Gibbs C & R Net has a very soft mesh which allows anglers to net Steelhead and release them unharmed back into the river. Calvin landed the other Steelhead using a Sage 2106 rod and a Shimano Calcutta 250TE reel http://fish.shimano.com Calvin was the "Hot Rod" on this trip! Calvin landed one and had another 2 Steelhead on which released themselves (AKA long-line-release) after a bit of a tussle. Calvin is a very gifted angler who has brought some very effective Steelheading techniques to the North West. One of his techniques Calvin calls "Dredging" and another would be the method which he cures his bait. Calvin uses Pautzkse's Pink Fire Cure on both his Chinook roe and on his Prawn bait. As most Steelheaders already know the quality of the bait is critical to Angler success. A huge THANK YOU to Glen for an awesome morning fishing trip on the Kalum! Here is some info on Glens custom Rocket Jet Boat: This boat has a top speed 48 MPH with 450 HP pushing water through a Hamilton Jet with a 10 inch impeller. When this thing takes-off, hold your hat and hang on! The Teflon bolted to the bottom of the boat allowed us to skim over the shallowest of water. Just fill in the "Subscribers form" and hit submit. 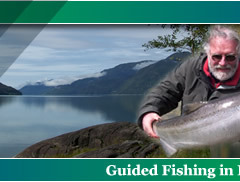 I also book guided fishing trips for whom I think are the very best fishing guides in British Columbia. I know all of them very well. They do a fabulous job and pride themselves on service and professionalism. Please note: it may take awhile for the podcasts to load. River colour is like chocolate milk! No Fishing upstream of the sign at the transmission line crossing (downstream of Zymoetz Canyon) Jan 1 - June 15. Steelhead fishing below this closure is still permitted. Need a fishing guide contact me anytime. MORE GREAT Halibut fishing - plus! Did I say, from the NEW boat? Looks to me, the guests are really, really happy. Why don't you join them in the fun? Contact me to book it anytime. REPORT - Nov12, 2018 from Tracey John Hittel of Kitimat Lodge, Halibut and winter springs have arrived want to get out this month call Kitimat Lodge. I suggest you lock in some dates soon by contacting me Tracey John Hittel anytime via e-mail tjhittel@telus.net or give me a call on my cell phone 250-639-4277. Have a good winter ♥ Oh did I say get some Dungeness Crabs too ??? Douglas channel have been producing lots of Coho this past week. We are still seeing the odd Chinook on the outer banks of the channel, but most of them have moved south to spawn. Over the past week we have seen really good action around Money Point and Turtle Point. Fishing over top of where the Queen of the North went down can be very productive as well. An anchovy or cut plug is always my go-to when starting to troll down the Douglas until I can figure out what the fish are to key in on. If you find that you are getting hit on a cut plug, put on a larger spoon in the 5-6inch range. If they are hitting the anchovy when put something a little smaller on. If they don’t like what you’re offering, switch it up! I typically keep roughly 20-30 different spoons in assorted sizes and colors in the box. You never know what's going to be hot at any given time. Each spring the Kitimat River receives it finest and freshest run of steelhead, this small non motorized, rafting river is freestone and easy to wade. We drift from pool to pool in 1-2 person rafts in search of the migrating grey ghost. Spring steelhead arrive in March and when they enter the river they are hot to catch on the fly. We recommend a 7 or 8wt single handed or switch rod with a 400-500grain line. Sink tips we recommend 10ft of T14 or Rio multi tip systems for different depths. A proper reel with lots of backing and a good drag system is recommend. Take the challenge and book for the month of April. BOOK your trip NOW don't be disappointed. District of Kitimat Council voted Monday September 18 five to two to create a “working group” of “concerned citizens and community groups” to consider the future of riverbank camping along the Kitimat river. The working group will consider issues such as access to the river, pollution and how to control extended camping along the river. Cast here for more information. in particular on the tributary rivers, we've also been using Rio's MOW tips in a variety of weights and lengths to get the fly down to the fish. The Heavy MOW tips, made of T-14 material, have been particularly useful, in lengths of 5, 7.5, 10 and 12.5 ft.
As with March, best colours have been pink, black, blue and orange. When fishing the Skeena and its tribs, larger flies from 2.5" to 4" in length have been most productive. Smaller flies in a variety of weights in the 1" to 2.5" range have worked the best on coastal rivers. rod and can confirm that it's a very good rod that's ideally suited to the coast! as above, except with heavier gear - 9 weight minimum, 10 weight better. Flies: Idylwilde String Leech, Bunny Tube, Marabou Tube and Popsickle, in shrimp pink, cerise, black, blue and orange. If you need info to book a pro fishing guide please contact me anytime. Halibut fishing out of the port of Prince Rupert has been simply outstanding. If you would like to book an ocean trip just contact me anytime and I will do my best to get it all set up for you. Fish from this Grady White for ALL the bottom fish plus ALL the Salmon, Dungeness Crab and Alaskan King Crab...with a captain who has over 40 years experience. If you are interested to book a charter please contact me anytime for ALL the details. One feature of the portal that may interest you is the real time and historic stream flow information for some of the rivers we fish and report on. February 15, 2019 This lady is from Italy and caught a nice Chinook (King) Salmon. Goes to show the ladies can catch em too, maybe more? Reason being “they” listen to the guide J !! We would like to thank Gord McKean for this beautiful pic. We got it ALL here, not only ocean but many, many rivers inland and coastal, year round. Oh, Gord is an AAG (Assistant Angling Guide) for Tracey John Hittel of Kitimat Lodge. Hope you all enjoy the pic. Well done Gord…carry on… Gord is looking forward to start guiding this spring on April 1. If interested and need more info please contact me Noel Gyger anytime. Oh, here is a short list of what we offer; Full service private suites, All inclusive meal plan, Cabins with full kitchen, fridge and stoves, Laundromat, Secluded location, Picnic tables BBQ and Fire pits, Wireless internet, Open year round, Steelhead & Salmon fly fishing, Conventional and spin fishing Saltwater fishing Salmon Halibut and Crab (Dungeness and Alaska King), Jet boat tours Skeena Kalum, Kitimat River Drift Boat fishing full and half days, Coastal Rivers, Nass River and tribs. Transport Canada approved vessels, Helicopter fishing, Hot spring Tours. WOW that is all I can say…lets talk. February 1, 2019 Pro fishing guide Gord McKean lands a beauty Steelhead here, just a couple of seconds out of water to take this fabulous pic. YES, the guide loves to go fishing on their own…when not guiding…BUT…when guiding the GOAL is to get their clients into the most fish possible…using a number of different fishing systems (fly or spin), and Gord, I must say, is one of the very, very best. Oh, Gord is an AAG (Assistant Angling Guide) for Tracey John Hittel of Kitimat Lodge. Hope you all enjoy the pic. Well done Gord…carry on… Gord is looking forward to start guiding this spring on April 1st. If interested and need more info please contact me Noel Gyger anytime. The bite is on folks! Fish are being caught closer to Terrace and Kitimat. It should not be long before we can fish local lakes now as well! Ross Lake near Hazelton should be ice free fairly quickly. Please remember that 100% of freshwater fishing licence fees go towards making fishing even better! The Freshwater Fisheries Society of BC is in charge of stocking local lakes. The society has also built a casting dock at Ross Lake and has invested money in the Lunan Road Boat Launch. So get your licence - go fishing! We would be more than happy to issue your 2019 - 2020 fishing licence at Oscar's. If possible bring your old licence with you. Also, stop by the shop for the freshwater regulations. We are exited to announce that Danie Erasmus from Prince George (www.princegeorgeflyfisher.com) will be back to Smithers this spring to teach three fly fishing seminars. Danie is an avid fly fisher and very good teacher. If you are interested in learning the basics of fly fishing or want to learn more about lake fishing don't miss these seminars! Thank you to the Freshwater Fisheries Society of BC to help with this event. Also a big thank you to Derek at Frontier Farwest Lodge for allowing us to use his lodge to host the events. Why I am in Court with the Minister again..
Hello, I am in court next week to stop piscine reovirus from entering BC waters. I already won this case, but the Minister of Fisheries refuses to acknowledge the court's decision. The Namgis of Alert Bay have filed a lawsuit to stop the Minister of Fisheries and Marine Harvest from putting piscine reovirus-infected farm salmon into their territory. A reasonable request as this is the law. These cases will be heard together Monday - Friday September 10-14, 701 W. Georgia St., Vancouver. This is a critical moment for the salmon farming industry, because they are so heavily infected they state they will be "severely" impacted if they can't grow piscine reovirus infected fish in their farms. By the end of the month, the BC government talks with Broughton Nation governments will decide the fate of the salmon farm tenures in the archipelago. Hello, Below is a link to an update on my efforts to protect wild salmon from salmon farms. I have hope we will be successful, but it is now a race against extinction of some wild runs. 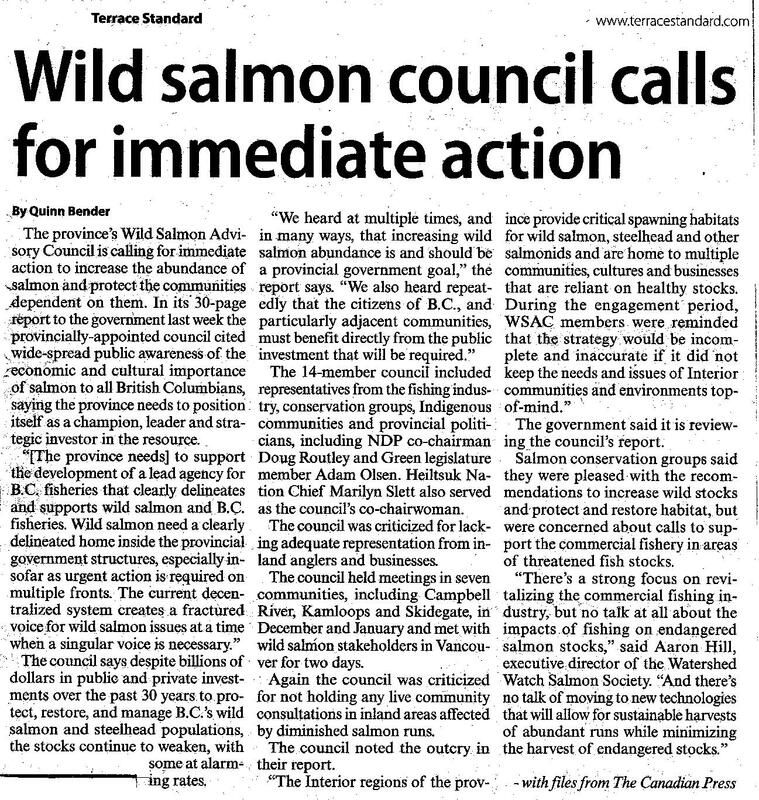 However, so many people are involved now that wild salmon have a much better chance for survival. On September 10, the real fight begins as my lawsuit with Ecojustice and a Namgis lawsuit are heard together in Vancouver to halt the dirty practice of transferring piscine orthoreovirus infected Atlantic salmon into salmon farms on the BC coast. This is against the law in Canada, and I already won a case ruling that the Minister of Fisheries must screen farm salmon for this virus, but he has chosen to ignore this decision. We have vessels hired by Marine Harvest following us everywhere; they have blacked out windows, more aggressive than smart for an industry on thin ice. However, a court ruling last week gave me permission to continue sampling near Marine Harvest farms, so the research into their impact continues. This fight continues to escalate. BIG PARTY when we hit one million views !! Kind of like: Fishing videos until you drop! ■ I am starting to post my "older" video clips on my YouTube Channel when I was still a fishing guide. I posted the first one yesterday. Title is Dungeness Crab Feast. Now, when I say older this one is 27 years old...but beauty I think, staring my two BEST friends and fishing buddies the late Ed Schulmeister and Lester Bryant. Hope you enjoy. I could do it all over again if I could and I did my BEST to help other fishing guides in the business. I was their chairman from 1996 to 2006. We were called SAGA (Skeena Angling Guides Association). Did I say the two guides landed 11 Steelhead? ■ Noel Gyger posted another video on his YouTube Channel; the video is titled "Bruce, Dennis and Grand Daughter Charis first Skeena River Chinook July 95", see Noel Gyger YouTube Videos, here is the direct link to the video: https://www.youtube.com/watch?v=w7kaxI4CScs&t=32s. 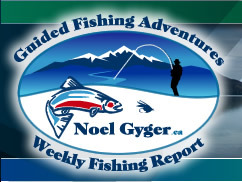 You do not have to be a fishing guide to benefit from advertising on Noel Gyger's website. All tourism businesses, tackle businesses and others will benefit. be to your entire satisfaction before posting, guaranteed. April Vokey visits Noel Gyger in his office in Terrace BC and explains to him how she would fly fish "his" rivers. Noel listened to every word. He knows April is the very BEST. Noel knows every inch of every river in northwest BC but is always willing to learn more how to fish them. Larry Schoenborn produced “Fishing the West” TV show and "Larry’s Travel Agency" out of Portland Oregon, USA.. Ed and I were not paid but all our expenses were covered by Larry. I can honestly and proudly say Ed and I thoroughly enjoyed the experience. Jim had fished the river a few years back and knew a few of the runs, but at that time did not have a boat therefore his fishing was limited. Property now has the Skeenashack rental cabin along with the main house. Highly recommended by Noel Gyger. Order now for yourself and your fishing partners. Call Jim at 1-800-501-6602. Hazleton, Skeena, Zymoetz, Kalum, Lakelse, Kasiks, Exstew, Khyex. The Seven sisters hiking trails, Pretty much everything downstream of Hazleton. Great rafting, jet boat rivers, Bird and wildlife viewing, scenery. Contact Noel Gyger if you are interested. We would like to thank ALL our sponsors. Without them the website and this fishing report would NOT be possible. RIVER FISHING Lots of lodge or day bookings still available on classified or non-classified waters. Guiding fly or spin fishermen with raft, drift-boat or jet-boat. Contact Noel to book NOW! I hope this fishing report, "meets with your entire satisfaction".